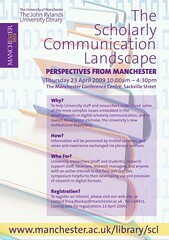 Details of an upcoming gig, The Scholarly Communication Landscape in Manchester on the 23rd of April 2009. If you are interested in coming, you need to register by Monday the 13th April at the official symposium pages. Why? To help University staff and researchers understand some of the more complex issues embedded in the developments in digital scholarly communication, and to launch Manchester eScholar, the University of Manchester’s new Institutional Repository. How? Information will be presented by invited speakers, and views and experience exchanged via plenary sessions. Welcome and Introduction by Jan Wilkinson, University Librarian and Director of The John Rylands Library. The Year of Blogging Dangerously – lessons from the blogosphere, by Dr Duncan Hull (errr, thats me! ), mib.ac.uk. 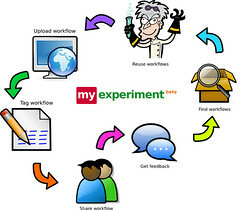 This talk will describe how to build an institutional repository using free (or cheap) web-based and blogging tools including flickr.com, slideshare.net, citeulike.org, wordpress.com, myexperiment.org and friendfeed.com. We will discuss some strengths and limitations of these tools and what Institutional Repositories can learn from them.